It started off innocently enough. I was warned by a few of my neighbours here that certain household items can be hard to find when shopping in Doha. It was recommended to me that if I find a brand that I once used back home, buy it in bulk as it may not be there next time I went to look for it. I took their advice with a grain of salt. I didn't feel I was attached to any brand or product in particular. Big deal if I had to use a new brand with a nice little arabic label scrolled across it, right? Wrong. Oh so wrong. My first solo outings here in Doha were for essentials only - groceries, baby items, and household things we didn't think to pack in our shipments. Needing those things forced a jet lagged version of myself out in those first few days when I was very wary of going anywhere without Colin. I would load Ella up in the truck and spend our mornings scowering the shelves of new stores, lists in hand, trying to get us comfy in our new digs. These stores had lots of 'stuff' - just not the stuff I was used to! I began noticing some rather 'odd' things when I shopped. For starters, where were these stores hiding all the good toilet paper? I consider myself a bit of a toilet paper snob, and, as my father says... "you have to be good to your bum, dear" (he is also a tp snob and has actually spent time calculating what the going rate of good roll of toilet paper is worth, so one you do some quick math to determine if you are getting a deal when deciding what to buy). While purusing the toiletries aisle, my heart starts to beat a little faster. All of this toilet paper is 1.) heavily scented, and 2.) coloured. What? No. Wait now. I want my double roll of cottony soft Cottonelle with the white puppy on the package. Not this peach coloured, sand paper-y, tangerine smelling nonsense. It turns out that the decent quality white stuff was the toilet paper minority on the shelves. My list goes on and on. I found out that I do in fact have very strong preferences to the things I want used in my home. It also turns out that over the years, I have become quite environmentally aware of the products we use every day... laundry detergent, household cleaners, all of Ella's baby products. Good luck finding any 'green' anything. (Don't even get me started on the absence of any type of recycling). The most popular items here seem to smell the strongest. Getting back to my point, I began to realize that the neighbour ladies were right. They have been there, done that and I had to start stocking up on some good stuff'. So, it became a sort of a personal challenge I would take on for the comfort my family. When I scored a bottle of Skippy Creamy Peanut Butter in the condiment aisle, it was a small victory for Clan Chisholm. But hang on now. A dark shadow of doubt inevitably started creeping in on my victory celebration. One, two, three, four. There are only four jars of Skippy Creamy on the entire shelf. Oh no. What if I can't find it again? I don't think I have ever seen it here before. Panic. Better buy two just to be safe. Hypoallergenic Baby Safe Bounce Sheets... a thrill of excitement runs through me when I find them in a random store one day. I never really used Bounce sheets before, but never mind. I need five boxes. Lord only knows when these puppies will be back on the shelf again. Organic baby food with no additives or preservatives? I practically clear the shelf with one swoop of my arm. Scoring any type of dog treat is a major milestone. Our boys are a tad bit spoiled. They actually have learned to expect a treat when they see us carrying in grocery bags. If I find a rawhide bone or a squeaky toy, my heart sings with pure joy. No one would believe what I went through to find and purchase a tube of Super Glue. Apparently it is a popluar thing as the shelf in each store I went to would have a label for super glue, but the box would be empty. Hmm. It is a whole other story when we talk about alcohol. Anyone who knows me, knows that I am not much of a drinker. I may have a drink or two a month, on average. But, put me in a place where there is only one liquor store in the entire country...well, who knows when I will visit it again! What if they suddenly closed it or it caught fire? We can't be caught without adult beverages in the house, now can we? Let's stock up! Our pantry is now ready for a major party for us and 100 of our best alcohol-drinking-friends at the drop of a hat. We laugh everytime we walk in and look at the stock pile. We have enough wine to float a boat. Guaranteed we will be giving away lots of it when we move. I now routinely stock up on everything when I shop. Why take the risk? Trips to the grocery store (often 'stores') is no small task with a fiesty 11 month old. I buy extra so we have it "just in case". HOARDER -A person who acquires and fails to throw out a large number of items that would appear to have little or no value to others. Well, that is not certainly not me. This stuff has big time value to others. Doesn't it? Me, a hoarder? Not a chance. I am more of a "Collector of Household Necessities". I have enough canned goods to keep us going for months if need be. 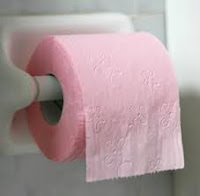 good luck with the scented and pink TP! Tasha I so much look forward to reading your blogs. They make me laugh and cry, but most of all excited, to hear of all of this stuff we take for granted. I just love your writing. Waiting in anticipation for the next one. I laughed right out loud on the bus when I read the shelf clearing piece about baby food. Funny stuff and familiar from our Saudi days when we had to get used to Galaxy chocolate bars and warm, non-refrigerated milk from Denmark. Also a TP snob but, in my own defense, with valid reason. My God, coloured AND scented? Past travel experiences have me fully aware that either will cause a horrific yeast overgrowth in private nether regions within mere days. I love the blogs, which I stumbled upon just this morning, but simply reading of this terrible TP hogging the shelves of Doha stores made me shiver.